Tips for competing in Future City! Future City uses the engineering design process as a framework to guide students through the creation of their cities. Within this framework, students apply specific project management methods to keep their projects on track. This structure gives students a real-world learning experience they can apply to future challenges in school, work and life. Learn more in Leading Your Team. Students spend approximately four months creating cities that exist at least 100 years in the future and represent the team’s solution to a citywide sustainability issue. The competition is made up of five project deliverables. At Regionals, scores from all five components will be added together to determine the top team. The 1st place team in each region will advance to the Finals held in Washington, DC. Can I still do Future City without competing? Yes! 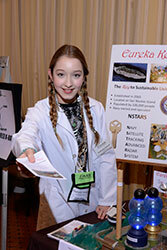 Future City is first and foremost a Science, Technology, Engineering, Arts, and Math (STEAM) program. Educators, parents, and mentors are encouraged to adapt Future City to match their individual goals. Talk with your Regional Coordinator about the various options. Visit Resources and download PDF’s showcasing how Future City aligns with many educational standards. 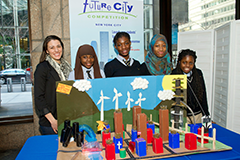 The “Growing Green” team from Mott Hall III in the Bronx, NY poses with their educator, Christa Buccola, and their city model at the 2015 NYC Regional Competition. 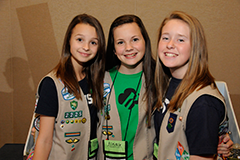 A Girl Scout troop represented Northern California at the 2014 National Finals. 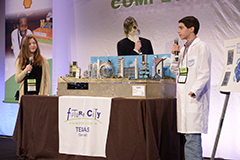 The team from West Ridge Middle School in Central Texas competes on stage at the 2015 National Finals. They earned 2nd Place!